I did something a little different this last weekend for Mother's Day. I found there was a single campsite available in Yosemite Valley on Sunday night, so we headed there for a little explore. I also did something just a little bit different at Tunnel View, and walked a bit into the tunnel to get the iconic view of Yosemite Valley framed by the arching granite of the tunnel entrance. Is there a tunnel exit anywhere in the world with a more incredible sight at the end? I'd love to hear any ideas. I found out something about sound in tunnels. 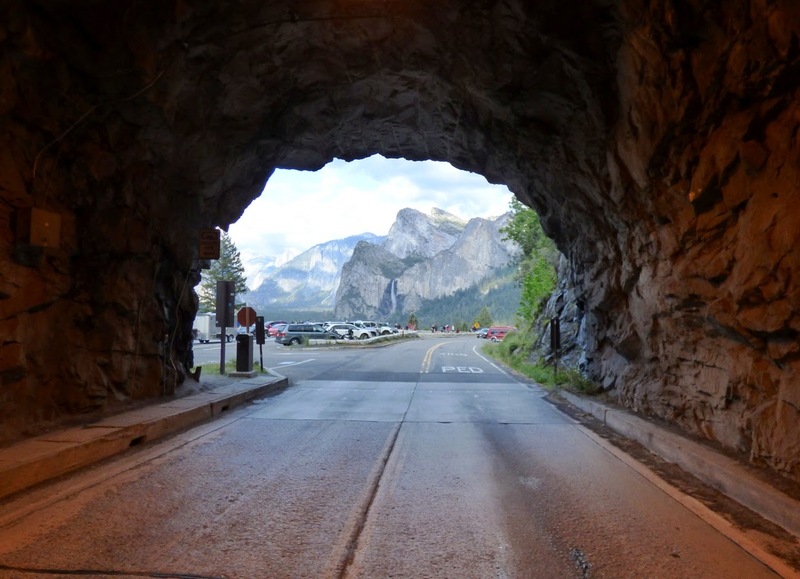 A car or truck can be a quarter mile away in the tunnel, but the sound of the engine is funneled and reflected to the point that it sounds like a jet plane right behind you. It was mildly terrifying. In any case, we concentrated on visiting some of the spots I don't get to see when I take students there on a field excursion. Those spots include the Mariposa Grove of Sequoia Trees from the last post, Glacier Point, Washburn Point, and Mirror Lake. 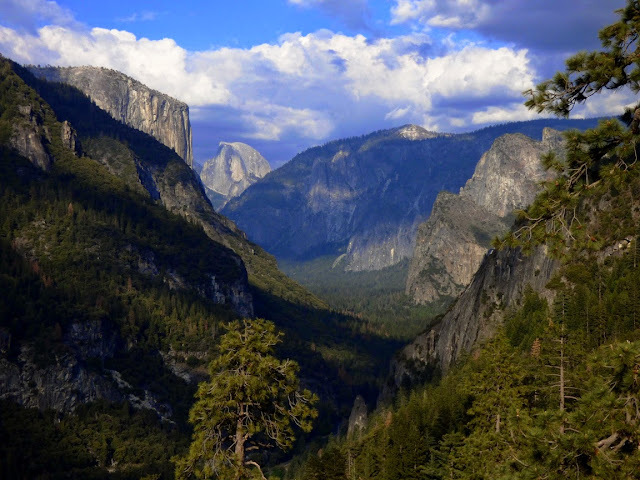 The picture above is the view of Yosemite Valley from the slopes of Turtleback Dome just west of the tunnel. I don't enter the valley from that direction as often, so the iconic rocks like Half Dome and El Capitan seem just a tad less familiar, and thus all the more spectacular. 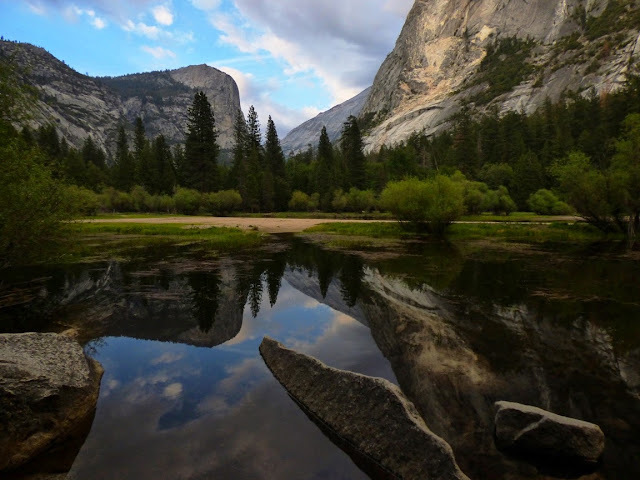 Mirror Lake is a deep bend in Tenaya Creek that backs up during the spring runoff to flood the adjacent meadow and form a wonderful reflecting pond. The pond formed because of a huge prehistoric rockfall that blocked much of the canyon floor. It is probably the largest slide documented in Yosemite Valley. A number of rockfalls have occurred in historic time as well. In March 2009, the Ahwiyah Point rock fall left the white scars on the cliff in the picture above on the right. It involved 46,700 cubic meters of granitic rock. Fortunately the slide occurred early in the morning and no one was injured. Cathedral Rocks are very famous and familiar from the west side where Bridalveil Falls spill over the cliffs. 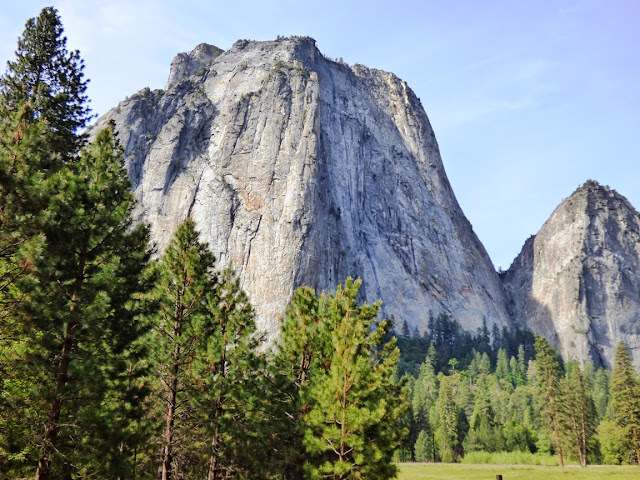 From the east, they are sometimes overlooked as the cliffs across the valley from El Capitan. In any other setting in the world, these rocks would be as iconic as El Capitan or Half Dome. People who are on short trips miss out when they only visit the valley floor. 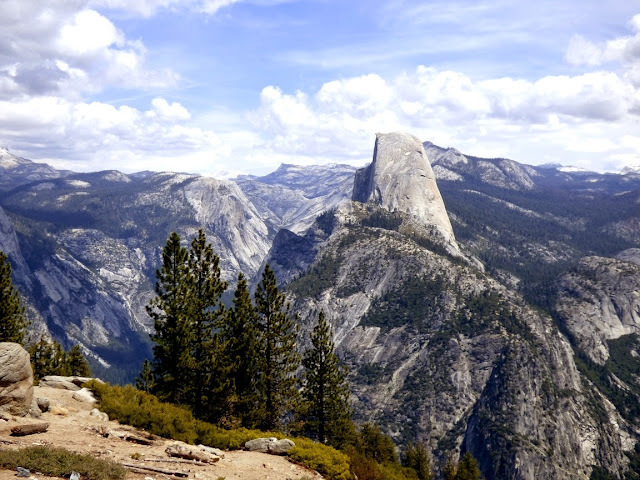 An excursion to Glacier Point offers one of the greatest panoramas in the world, seeing the entire extent of Yosemite Valley from 3,000 feet above. The video below shows part of the sweeping view. But if you make the time to see Glacier Point, don't miss Washburn Point. It gives an entirely different perspective of "Half Dome". What works better? Four-fifths Dome? Three-quarters Dome? As promised, here is the gratuitous bear cub. 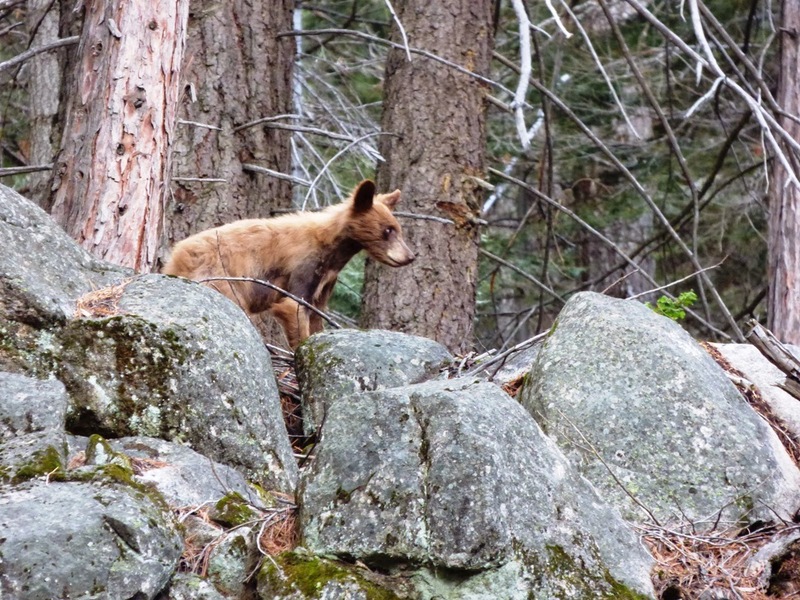 The bears are emerging from hibernation, and we saw a mother Black Bear and her cub above the highway near Chinquapin (the turnoff to Glacier Point). They were being good and doing bear things in the forest instead of breaking into cars in a campground. It's taken a few years, but most of the tourists have finally been trained to stop luring bears into the campgrounds, and the crafty old campground bears have died off or retired, and there aren't new mama bears teaching their cubs how to break in. In the late 1990s nearly a million dollars of damage was done by the bears, but in the most recent year the damage was only about $5,000. For the record, although the bears are incredibly strong and heavily armed (clawed), they have been very patient with humans. There has not been a single fatality in the Sierra Nevada that can be attributed to a Black Bear. We have unfortunately killed lots of them, mostly with traffic collisions. The extinct California Grizzly Bears were a different story. Only a fraction of the Black Bears in Yosemite are actually black. They range from black to brown to blonde. If the cub above is looking a bit bedraggled, it is losing its winter coat. I may seem close from this view, but I was a good 200 feet away and across the road. A zoom lens is a wonderful thing in wildlife photography! What beautiful pictures! Thanks for sharing, as always. Tunnel View is the best but the views from the beginning, middle and end of the tunnel in Zion is up there and then in a more urban setting the Rainbow Tunnel right before the Golden Gate Bridge is quite nice.